Outstanding feature of the scheme is the floodlighting, which combined considerable imagination and sensitivity with a thoroughly professional grasp of the problems of engineering and light distribution involved. 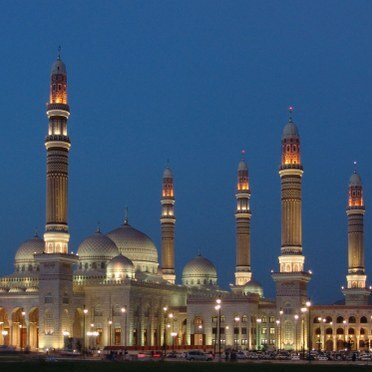 Built at the President's expense to accommodate 44,000 worshipers, the $60 million Mosque combines Yemeni architecture with classic Islamic elements, such as minarets, domes and arches. Using a mix of Contrast and OQ 1000 floodlights allowed great flexibility in the play of light upon the exterior and ground recessing certain projectors made it inconspicuous in daylight. Flow of light techniques were relied upon rather than dramatic use of spotlighting and by this means over-emphatic highlights and shadows were avoided, as was obtrusive light. The scheme is striking and the six minarets, each soaring 100 metres high, are visible from a considerable distance at night. Such a complex project made for numerous lighting calculations, and even if lighting levels could be mapped over drawings, the aesthetic quality of the light could only be judged by the eye. So Thorn used 3D design software to supply colour rendered rotational visualisations to the client for a mock-up of the lighting effects. It was then possible to see the modelling which had been impossible to draw and to arrive at the best range of brightness and colour in the quality of the light.